Mac OS X Snow Leopard would allow you to assign applications to a particular space using a control panel in System Preferences. This is no longer the case with Mac OS X Lion which offers a completely different option for assigning applications to spaces. If you want to assign an application to a particular space you simply Control+click or right-click on the application’s icon in the Dock. Now look for the Options menu and you’ll see a section labeled Assign To which contains three options: All Desktops, This Desktop or None. 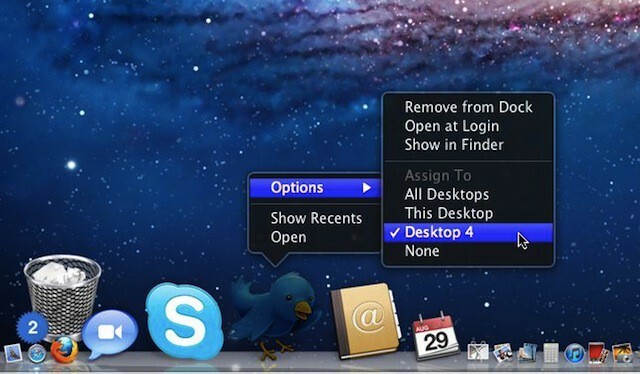 All Desktops – the application opens on each desktop (space). This Desktop – the application opens on the currently selected desktop. None – the application will open on the current desktop. Once applications get assigned to desktops you’ll find them listed when you Control+click or right-click on their dock icon just like in the image above where a Twitter application shows that it is assigned to Desktop 4.